The purpose of a good blog is indeed to showcase: your know-how, your credibility, your grit, your determination, and everything you stand for as a brand. However, the purpose has a lot of moving parts involved in order to achieve engagement from your target audience. Getting from your main idea to your call to action requires time and direct attention to your creative process. How will you engage with your main idea? And, how will your audience respond? Trying to “showcase your knowledge and credibility” first relies on your ability to write openly and two more blogging habits we will discuss at length in this article: editing in layers and thinking with a visual lens. Creating blog posts that engage with your target audience has everything to do with how well you blend the creation of your content with your editing process. “…there is a fine line between writing with your voice, and how you need to write for your clients. How will my speaker read this post (the company you write for)? How will I read this post (as the seasoned content writer)? How does this post reflect my research? How does this post reflect and respond to the needs of my target audience? Yes, I am serious. Truly engaging content requires multiple layers of reading and editing in order to be effective. In this marketing world that’s shifting more and more into the realm of context is king, you must be willing to take your time and think through the intent and purpose of your content. The best way to tackle this task is to edit through one point of view at a time—making specific notes and edits to your content based on what fails and what succeeds with each reading. ProTip: If ever find yourself getting stuck throughout this process, seek collaboration with your team. Have someone read it for as a specific audience you’re having trouble with and request feedback. Taking a visual approach to your blogs is about more than adding an infographic or quirky image that grabs attention. If you’re looking to create content (no matter which type) that resonates with your target audience, you must always try to visualize what the entire deliverable looks like as one gift-wrapped package. Are you creating an in-depth look into the different products you provide? Are you preparing a massive argument for blogging a different way? Are you trying to do something no one else in your industry has ever done before? No matter what topic you’re addressing in your post, there could always be something else you can add to give your readers an extra happy or lagniappe (as we say in Louisiana). Being able to visualize different opportunities for content delieverables could easily be that one thing that gives you the edge over your competition. The key is in the how. While you brainstorm topics, or create your first few drafts, or make your first round of edits, try to visualize what your users are searching for (and not just keywords). Visualize what your audience is looking to use or why they are searching in the first place. Put yourself in their shoes and try to imagine the situation that brought them to that specific search keyword. Is there something I can provide alongside this post that will be helpful? Are there things like case studies or videos I need to upload to this blog? Have I provided everything that’s needed to address the topic I am addressing? Visual thinking doesn’t end there. Because engaging content needs to be the perfect blend of unique and useful, it’s important to think visually, before, during, and even after you’ve finished blog posts for your company. Is this content meant to be a blog post or would it be better as a PowerPoint or SlideShare presentation? What other, new posts or graphics or pieces of content can I create to further this idea and supplement it? 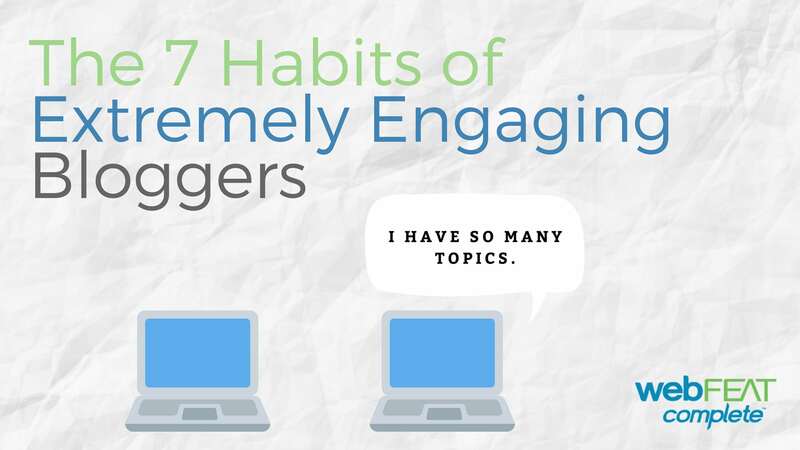 Adding this habit to your blogging toolbox is all about understanding your role in your audience’s online experience. Sometimes we’re not 100% clear on what we are actually looking for as users. You must be the provider. If you can practice visualizing what users might need while you brainstorm blog topics or create new website content, you will be that much closer to closing the gap between organic website traffic increases and contact form completions. Coming soon to a blog near you (here). Hanna is a Digital Media Designer who loves to blend SEO content strategy with UX design. It's her duty to ensure that your company is represented in a way that your audience will understand. When she's not restructuring and creating website worlds, she loves to paint, write poetry, and dance in the kitchen.